Penny grew up in Nottingham, England. Her Mum and Dad are both musical  "Dad is Welsh and you couldn't stop himsinging if you offered him a million quid. Mum played piano and also loved to sing." says Penny. "We always sang in the car and I developed my love of singing, and harmony in particular, from trying to fit in around what Mum and Dad were singing in the front seat." Penny learned folk songs from Miss Baker, a great teacher in Primary School, who used to stand up and bang away on the `old joanna' in the hall and peer at the kids over the top to make sure they were singing. "We did sing and we loved it." In 1966 Penny's family emigrated to Australia, along with many other ten pound Poms and they made their home in Queensland. As a teenager in the late 60's she was influenced by the fantastic pop music. She also tuned into Fairport Convention and other folk acts around 1970 and started singing in a living room band in 1971 when she moved to Sydney. "We sang mainly British folk material at the time." She had some good friends who really encouraged her as a singer. Patrick Irwin (now an architect in Perth and still a great friend) being a wonderful influence. The band moved to the Gosford area - got a name, The Oak Road String Band and an occasional gig. Penny got a guitar and she and Patrickleft the band. Later they formed a trio called Danu with a songwriter, and did some gigs in Sydney winebars. "Rather suddenly one night we became a duo, so Patrick and I continued to sing together for a while and then became part of a rock band for a few months. All good formative stuff!" Roger was born in Sydney in the early 50s and grew up in Hurlstone Park, a Federation suburb six miles from the GPO. His Mum played piano and steel guitar, his Dad the paper and comb. "My family were always having singalongs around the piano. I'd rhythmically thump anything in sight, and plunk on a ukulele. I got into guitars by way of cowboy movies. They'd sit around campfires, play guitars and sing in wonderful harmony. What a great life, I thought, particularly the playing and singing aspect. Droving cattle and being shot at by baddies didn't have the same appeal!" says Roger. He was impressed with the guitar playing of Duane Eddy, the Everly Brothers and the jangling of a Rickenbacker 12 string and the folk rock of The Byrds. Roger and his brother taught themselves guitar by listening to records, working out the chords, and playing along with The Byrds, Lovin' Spoonful and Buffalo Springfield. Being the mid 60s the folk revival was in full swing and much of the popular music at that time wasbased on folk and traditional music. After learning to fingerpick and encouraging some of his friends to take up the guitar, Roger and his friends formed aband which metamorphosed into the SouthernRoad Band. 1971 saw them performing in folk clubs around Sydney before finally folding in 1974. "During this time I also played guitar and banjo for a host of soloists, such as Al Head, Teri Welles, Paul Pulati, and was a session guitarist forABC radio's musical kids' shows, which featured lots of folk songs." As the Sydney folk scene started fading in the mid 1970's, Roger moved into electric folk and country rock. Penny and Roger met in 1976 and were married in 1980. Penny studied Audio Engineering and got some experience in recording (including Ice House's first demo!) 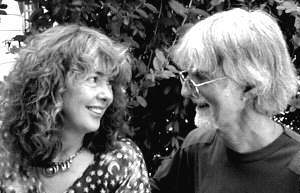 Over a period of time, Penny and Roger developed as an acoustic folk duo with their own style of Australian music. Their self-penned songs are about Australia with a home-grown Australian flavour. "We both feel it's important to express something about where and how we live- Australia is a rich vein to mine" says Penny. "I did a degree which involved Media Studies and Creative Writing, and we started to get some recording equipment together to make an album.We had both written some songs and there were some Australian folk songs we wanted to record too. We actually recorded and put out our first album RESTLESS before we played a gig together as a duo." They started playing around Sydney folk clubs to promote their album and met lots of Sydney folk people and began to record them as well as themselves. Their little backyard studio in Balmain was quite a busy place for a few years. In 1982 they formed their own folk music label, Restless Music . This year they celebrate twenty-one years as a recording label, and to date have recorded and released around 100 albums by various Australian folk artists. In 1987 they departed Balmain for a 32 acre block in Stanthorpe, Queensland where they set up their recording studio again. "We still have the recording studio and are involved in our own and other people's musical projects" says Penny. They have toured all over Queensland with the Queensland Arts Council over the past 13 years. Together, Penny and Roger have released15 albums, written many songs and in the mid 1980's, they became friends with Bill and Mavis Scott, and commenced a songwriting partnership that is ongoing. Penny and Roger have been very fortunate to have had a lifetime's involvement in music and their son, Jordan, seems to have picked up their enthusiasm. Roger says, "I figure I'll keep playing all my life, professionally until I no longer come up to my own standards, but certainly in friends' living rooms and on their verandahs until they cart me away."